Increased investment in community rail and a new schools education initiative also figure in the investment under a new agreement between Stagecoach Group and the Department for Transport (DfT) which will see a new franchise starting in October, to run until at least March 2018. East Midlands Trains says customers will benefit from a wide range of improvements with a fares freeze on Anytime fares to London, a ticket sale offering 250,000 discounted tickets, cleaner stations, roll-out of a new “Cafe en route” to provide an enhanced on board service, new technology to help provide faster and better customer information when and where customers need it and a new automated refunds system. Local communities will gain from the new deal, which will see an extra £250,000 invested in community rail (the Grantham to Skegness line is a community rail line), the introduction of a new schools education programme and continued investment in apprenticeships and graduate schemes. Taxpayers will benefit from the agreement, with £150m of forecast premium payments to the Government between October 2015 and March 2018. The new franchise will commence on October 18 and run until March 4, 2018. The DfT has the option to extend the contract by up to one year. Martin Griffiths, Stagecoach Group Chief Executive, said: “This is a significant package of investment for customers travelling on East Midlands Trains. It will build on what our team has achieved over the past eight years and deliver further valuable improvements for the millions of passengers and many communities who rely on the East Midlands Trains network. “Britain’s railway is part of the fabric of our communities - that is why our plans include more opportunities for graduates and young people, new links with schools, greater investment in community rail, and improved training to help our employees deliver a first class service to customers. Jake Kelly, Managing Director of East Midlands Trains, added: “Over the past eight years, we have demonstrated our commitment to providing the best possible service for our customers. The agreement with the Department for Transport will now allow us to invest even further in the areas that matter most to our customers. 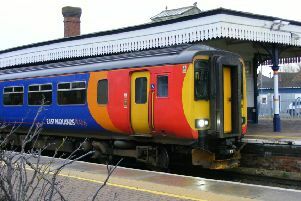 Since the start of the East Midlands Trains franchise in November 2007, East Midlands Trains, which was named Passenger Operator of the Year last year, has delivered a major programme of improvements for customers. Investment in people – more frontline staff to help customers; enhanced customer service training for employees; providing more opportunities for graduates and young people.